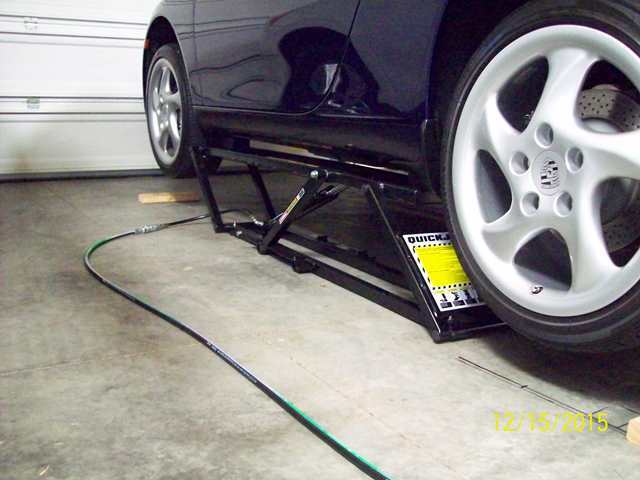 After researching scissor lifts for my 996 with limited garage space I decided to go with the Quickjack 5000xl. The "xl" means the length is extended so that the lift pads will line up with the jack points on the car. The standard 3500 and 5000 models are not long enough. It arrived well packed, no damage, pretty easy assembly, and decent instructions. 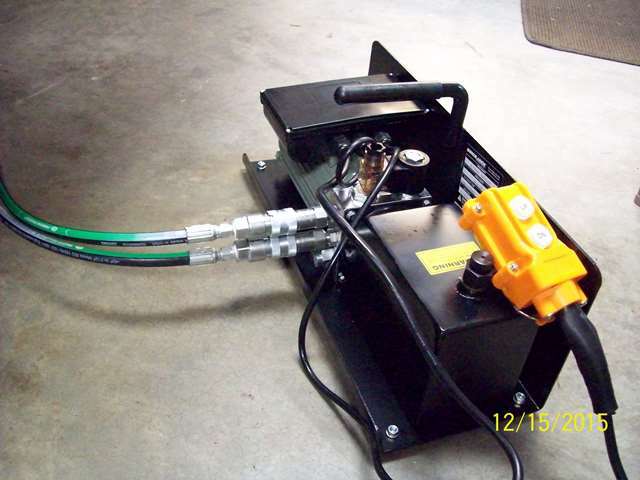 Nice little hydraulic power unit with good quick-disconnect hose fittings that don't leak. Only issue was that one of the long extension hoses was not crimped properly and would it would not allow any oil flow. Only one side would raise up! Rather than wait for a new set (of VERY cheap low quality hoses) to be shipped I went to my local hydraulic hose shop and had them make up 2 really nice flexible Gates (USA) hoses. That solved the problem and the lift works well. One advantage of this type of scissor lift is that there are no cross-members so nothing underneath the car is obstructed. How high does it lift? 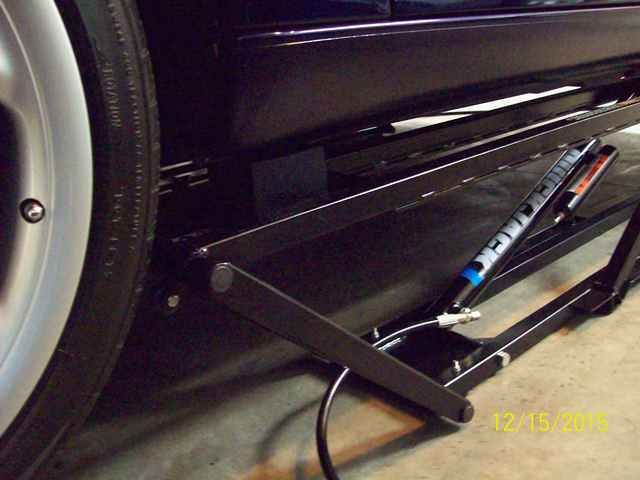 21" on the lift and then there is a rubber spacer of like 3"
Do you think it is ok to use to keep a car lifted for extended periods of time (using the locking bar of course)? I'd be circumspect about leaving the car with the suspension hanging for long periods. Porsche actually had a TSB recommending against doing this. It is one thing to leave the car in the air while working on it, another to store it in that position. Thanks for that.. I didn't really think about any possibility of damage to the car but don't think I will be doing this option then! I heard that to avoid flatspotting the tires, the car should be driven every 2-3 weeks and I can sometimes go months without driving it unfortunately. I bought race ramps flatstoppers but didn't like driving up onto them... I guess I'll keep using them but push the car on them next time. I would not be overly concerned about flat spotting as it is overly exaggerated. We store cars for as long as six months without ever starting or moving them; and while the car show some slight signs of flat spots when they come out, 5-10 min. of driving and all evidence of flat spotting is gone. Cars that suffer permanent flat spotting have a tire problem, not a storage issue. Thanks for putting me at ease about my situation.... and saving me alot of $! Did manage to take it out again for a last spin this year. I am also looking at this lift (quick jack 5000xl) for my 911 and Cayenne. Regarding the lifting height, I read a max height of 21". Is this enough height to change the clutch on the 911? Is there enough height at 21"to drop the engine and/or transmission. many thx for any input.